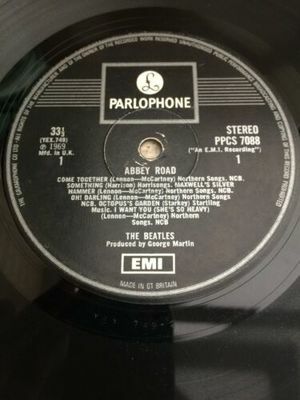 Beatles Abbey Road Export Album PPCS 7088 Silver/Black One Box EMI Very Rare. This is the second version of this record which sold in very limited quantities in countries where the Apple brand was not yet registered.. The record looks vg- to both surfaces with some small have scuffs and hairline/bag rash but there are a couple of issues on side one where the first 30 seconds of Come Together has some background noise and the same noise for 10 seconds on I Want You, there also one skip during this time. This only occurs on my project turntable with an ultra low tracking weight, it doesn't happen on my Dansette player so may benefit from a professional clean! The rest of the record plays good with some light background static noise especially in the quieter moments. Stampers are MMP6 and AAO3, matrix are YEX 749-1 and 750-2. The labels are very nice as per the pics. The cover rates as ex- with the usual handling and storage marks but it is fully intact. Overall a nice cheap rare export from 1969. Please see the pics as they form part of the description. The Pretty Things First U.K.original Fontana Album .Rare.R&B vinyl.LP. 1965.